This update post is pretty close to my last update in comparison to my usual month gaps. I'm finally over my cough/cold which I am beyond happy about!!! As you know.. time is whining down on our Ayva countdown! I'm 35.5 weeks (36 weeks on friday) and well into my 9th month! We have 30 more days till she is "full term" and or "due" (2/10/12) but we ALL have a pretty good feeling that she will be here this week... no later than the end next week. Mama isn't stretching or growing anymore so Ayva wants out! Hehe. She jerks my stomach around in a million directions for hours at a time now a days creating this scary twilight vampire baby visual for anyone around me to see. I went to the docs today due (slightly urgent appointment) and they checked "things" out. I'm currently 1 cm dilated, supposedly very thinned out and her head is literally... RIGHT THERE. My doc says she is pretty sure I'll be in early labor anytime soon since my body just isn't big enough to keep her in till 40 weeks. Everything is all set up and ready for Miss Ayva's arrival. Being the "must get things done" type of person I am.. I've been aiming to have every single thing set up and done since 30 weeks lol I just didn't see myself making it to 40 and I hate doing things last minute. 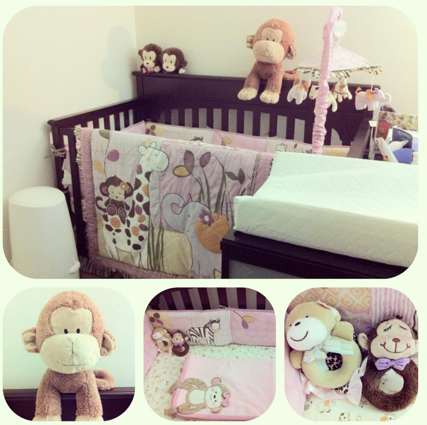 As said in my last personal post, Ayva will not have a "nursery" because she will be staying with us. All of her things are nicely set up in the master bedroom as you can see! This is her little corner. 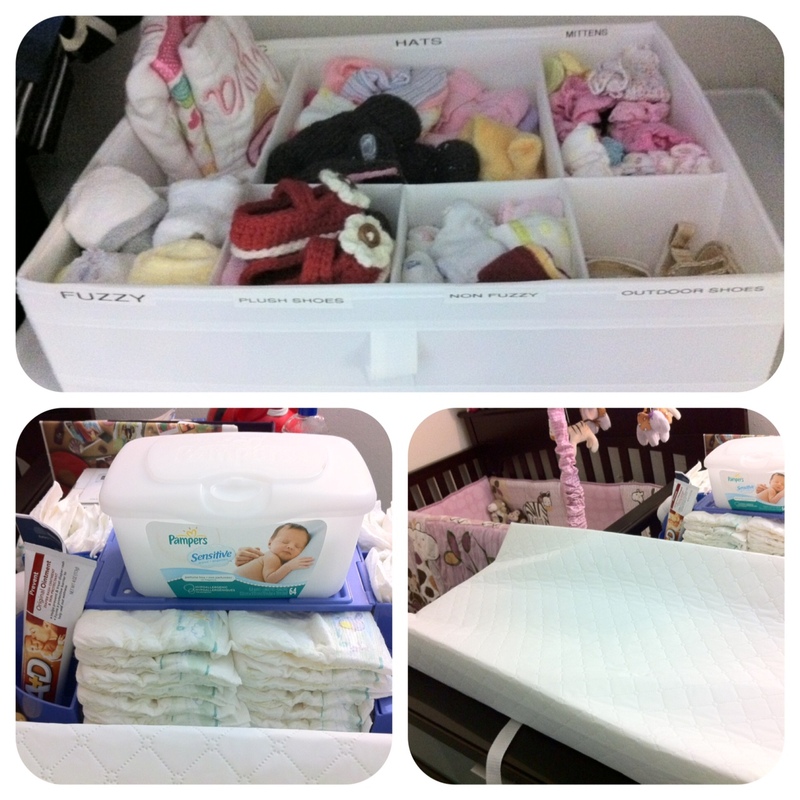 Crib, mattress, bedding set.. all washed & ready! And with her mama being born the year of the monkey (and it being my fav animal) & her daddy having the name "monkey" you can imagine there are waaaay too many monkeys everywhere haha. Her diaper genie and changing stations are close by if you can see. Again as stated before she is sharing a closet with daddy and I found the most adorable & affordable baby hangers at Marshalls yesterday so hold her "must be hung" dresses and random jackets. And with her cousin (my niece) taylor sending so many adorable clothing items her way she is pretty well stocked without mama shopping much or at all. Though, I am guilty of buying that grey dress... it was 75% off ($6!!!) =/ I can't resist animal print deals! 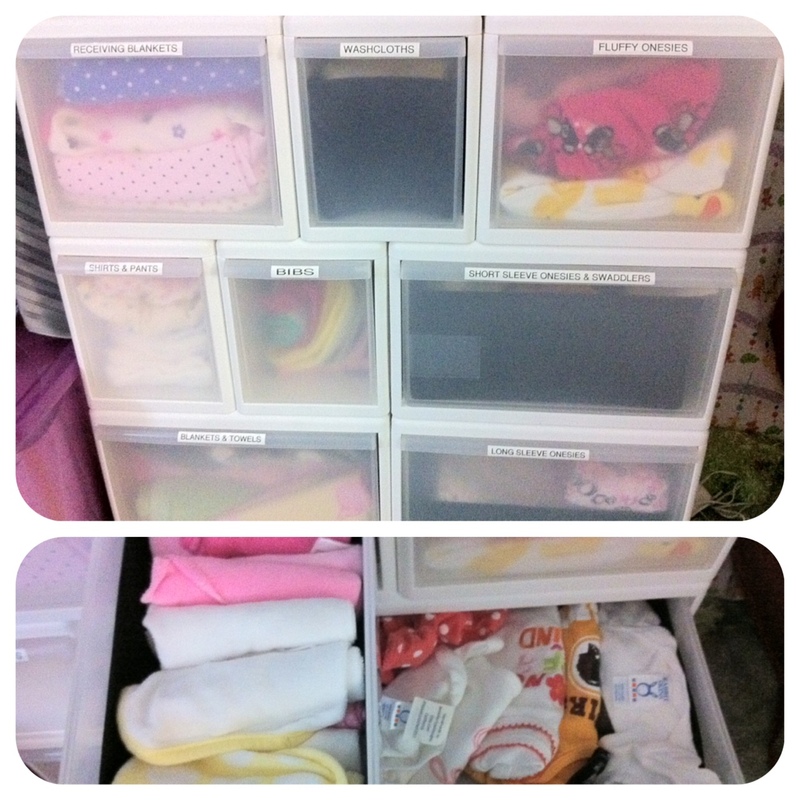 & the random box thing on top is something I had lying around from IKEA. All nice, labeled and organized! As you can see, onesies are broken down to short sleeve, long sleeve... bibs, furry blankets, washclothes etc etc etc. And more pics of her diaper changing pad station shown at the bottom. & last but not least! A picture from my office/recording studio of my belly bump! This is me.. at 9 months! So this is most likely biggest I'll be getting with almost 5lbs baby in my tum tum (docs recent scan estimate). **Thank you to all who have complimented my bump in the past few months say it was adorably small. Really you all are too kind! I'm pretty lucky because all of my "XS" clothes are just starting to feel snug and I'm just about done so if I just wear my "S" clothes I should be good to go! I'm about 111lbs right now. So the 108lbs estimate at 40 weeks was a bit off but it's okay! Oh and you can see my diaper stock pile in the background. With my extreme couponing sister and a bunch of gift cards/store credit I paid.. nothing out of pocket for all of those boxes! & THERE ARE MORE in the closet! I hope you all enjoyed all of the pics and maybe it inspired you in some way storage wise? I figured why not share my hard work with you all hehe. Im excited to see baby Ava ! && i like how you organized everything so neatly ; when i have a baby ill def. organize the way u had done cause it would be easier to find things ;) ! omgggg im so excited for you!! 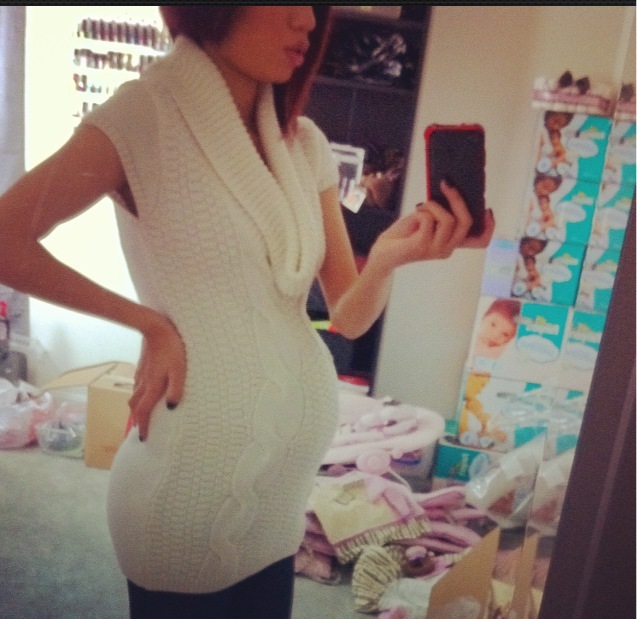 I love your belly, it's so cute and round =), makes me want another little one. But that's just going to have to wait. Hope that your labor and delivery is a peaceful one. congrats for stocking up on diapers!!! 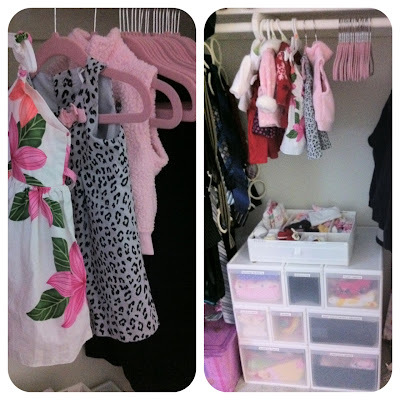 i did the same with my first daughter, organized all her clothes and shoes but within 6 months, it was a mess, but a pretty, pink lovely mess :) good luck with labor!! Awww...her crib is super cute! Before u know it your baby girl will be here. You're going to enjoy motherhood and its truly a blessing! Thanks for always responding to your viewers! Take care. Girl, you crazy (in the most awesome way). I don't understand the process of pregnancy so when I saw the 1CM dilation I assumed instant labor. I'm a noob. Congrats!!!!!! I'm so glad to have found your blog!!!! I really enjoy reading your posts!!! If you have a chance, please visit/follow my blog. Your supports will mean the world to me. Thank you so much in advance! Have a great day!!! OMG! love your blog. Congrats on the expected baby girl!